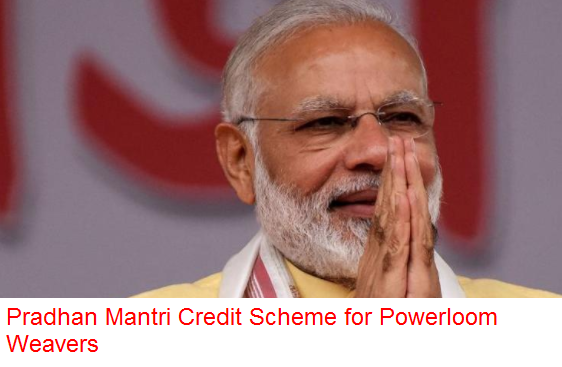 The Pradhan Mantri Credit Scheme for Powerloom Weavers has been launched recently in the country. The central government has stated that the ailing textile industry will get financial help from the central government and also technological upgrade will take place to enhance the industry in India. Approximately 2.5 Million powerloom weavers will get benefitted from the scheme. The scheme has announced by the central government during the month of April in 2017. During November 2017 the scheme has launched officially. When it was announced, the reports said that up to 50% subsidy will be provided to the scheme. However when it is launched it says that up to 90% financial subsidy will be provided to the weavers across the nation. The subsidy: All the owners of the powerloom units in the country will get up to 1 Lac subsidy that is up to 20% financial assistance on their production cost. Interest Rate and Loan Amount: the Central government will provide loan amount up to Rs. 10 Lac for production. The interest rate will be 6% per annum which is lower than the market rate. This loan will be provided for 5 long years. Solar Panels: According to the scheme the owners of powerloom units can install solar panels in their lands. If they do so, they will get more financial assistance from the central government. With installation of solar panels, it will be easier for the small units to produce more in short span of time. Number of Looms: If any unit has more than or equal to 8 looms in a single unit then the owner will get 50% subsidy on installation of solar panel under this scheme. Beneficiaries: The units of powerloom will get benefitted under the scheme. It has been said that with implementing this scheme nearly 2.5 Million weavers across the nation will be benefitted. Technological upgrade: SAATHI or Sustainable Accelerated Adoption of efficient Technology to Help small Industries will be adopted for technological upgrade in the textile industries. Gujarat, Tamil Nadu and Maharashtra are the three most highlighted states that are said to get the most benefits under this scheme. As of now maximum number of powerloom units are located in these three states. Around 108 numbers of powerloom clusters are there in the entire country. 50% of them are in Maharashtra. There are 72 textile parks are there in the nation today. Apart from this, by implementing this scheme nearly 57% of the production will be expected to increase in the country. The entire fund will be given by the central government of India. The fund will be provided to upgrade the units and to establish as many as yarn banks in the country. Also the under this scheme the number of looms in group work-shed has been reduced to 24 from earlier times when it was 48. The textile and powerloom industry is witnessing hard time in the economy. No development has been shown in the industry for past few years. Many a schemes have been launched yet no awareness has been seen in the same industry. However the central government is hopeful about this scheme. Also the central authority said that by installing the solar panels it will be easier for the small units to repay the loan within less time. It is expected that within 3-4 years the small unit owners will be able to repay the entire loan.